This afternoon I shut down all the computers, network equipment and network storage devices so that I could put in a new Uninterruptable Power Supply (UPS). I’ve had two previous UPS’s, one that lasted several years that was built by APC and one that didn’t last very long that was built by Belkin. 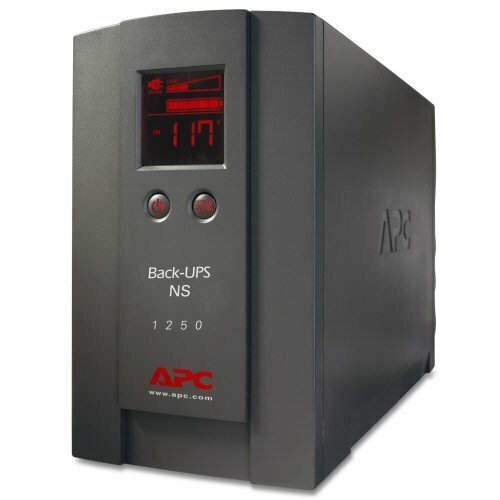 This week I received an email from CDW that included a 1250VA, 750W APC UPS for $99.99. The next closest price I could find was $158 and most were around $200. From Amazon the price is about $380, though they have associates selling it new starting at about $110 + shipping. So, as you can see, this was a deal I couldn’t pass up, especially since I was running without a UPS and suffering from time-to-time because of it. Even better, when I actually went to the site the price was only $89.99. Once the $20 shipping and $9 sales tax was added I ended up at about $119. Still a good deal and it came with a 3 year warranty and Parachute Personal UPS software. Ordered Monday, delivered Thursday. You can’t beat that! It did take a little while to get things together as I did some better labeling and moving around of stuff. The cords are quite a bit cleaner now, I was able to remove a power strip and am only using two outlets on the other strip. AND I now don’t have to restart servers… if the power goes out for a short period of time! The UPS states that I’m running at about 40% and would have about 14 minutes of uptime on the battery should the power go out when everything is turned on. Pretty good considering everything I have hooked up to it. So far I’m really impressed by this latest addition to the office and would have to give APC two thumbs up. The only issue I had was that the cable strength was reduced by running it through the UPS, so, I put that back to straight off the wall. I’ve never run the cable through a UPS, so, wasn’t a big deal to me, especially where we rarely have lightening around here. So, this afternoon’s project is done! About a month ago, November 2014, I noticed my PC and NAS’s were not running, neither was the UPS. I was able to bring the UPS back up but got a battery warning. A replacement battery is $89.99, geeze, that’s what I actually paid for the whole unit new. What also is interesting is they say you should swap out the battery after 5 years. Low-and-behold, it died after 5 years. Always seems suspicious to me, especially after I pulled the battery (actually 2 x 12 volt batteries chained) and found it was outputting 24 volts. Must be the amps are down or something. Anyway, has been a respectable UPS and, at roughly $24/year, I suppose I can’t complain. Just finished placing my order for a new UPS from NewEgg.com, this time. Shopped around a bit before selecting this one and paid about $22 more than if I’d gone with a 1300VA model via Amazon. 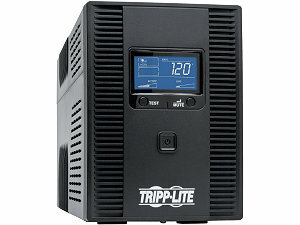 Got the Tripp Lite OMNI1500LCDT 1500VA 810W 10 Outlet UPS. Let’s hope it is at least as good as the APC UPS I’m replacing! Certainly not the same great $119 deal I got 5 years ago, this one came in at $160 after tax and free shipping.